What is a dreamfeed and how can it help your baby sleep through the night. This post answers all of your questions about a dreamfeed. When you have a baby, you want to do everything you can to get as much sleep as you can. If baby sleeps, that means you can sleep. A great tool for helping baby to sleep longer through your night is the Dreamfeed. Keep reading to learn what it is and how to implement it. This post contains affiliate links. 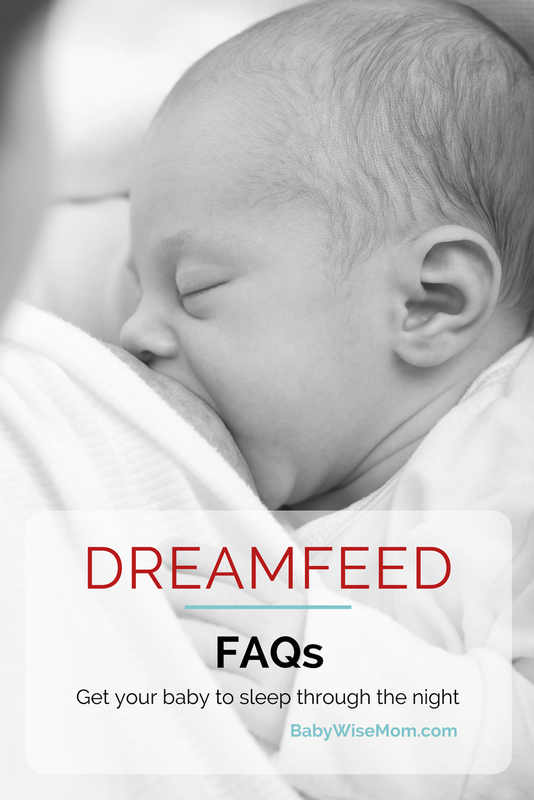 A “dreamfeed” is referred to as the “late evening feeding” in On Becoming Babywise. This is the last feeding of the day before you go to bed. For more on the dreamfeed definition according to Babywise, see Dream Feed and Babywise. For more basic information on the dreamfeed, see The Basics of a Dreamfeed. What time should I do the dreamfeed? The dreamfeed is typically between 10-11 PM. Baby will be in bed already before this feeding. In the early weeks, you might want to go to bed around 8 PM or so because you are so tired! That is fine. Just set an alarm to wake up and feed your baby the dreamfeed. A feeding after 11:30 PM is not a dreamfeed; that is a night feeding. Time your dreamfeed 2.5-4 hours after the final feeding of the day. You want baby to be hungry enough to take a good feeding at the dreamfeed. However, you don’t want it so late that it disrupts nighttime sleep. Disruption to nighttime sleep will cause baby to wake earlier in the morning. Take note of what time you do the dreamfeed and how baby sleeps. I have found that McKenna sleeps later in the morning if her dreamfeed is closer to ten then if it is closer to eleven. Why do I need a dreamfeed? Your newborn baby needs to eat 8-12 times per 24 hour period. By doing a dreamfeed, you work a final feeding in during a typical “day” for you so you can get more nighttime hours of sleep. Once baby reaches a point that he can sleep through the night, he will be able to sleep through your night also. If his last feeding is 7 and he then sleeps 7-8 hours, that puts him waking at 2:30-3:30. But if his last feeding is 10 and he sleeps 7-8 hours, that puts him waking 5:30-6:30. Should the dreamfeed be at the exact same time each night? You can do it at the exact same time. However, I don’t think it is a bad idea to vary it. Varying it has several advantages. One is that baby won’t metabolically come to wake up for a feeding at that time (though I think this is rare). Another is that you can experiment and find the best time range for the dreamfeed. Once you find it, you will most likely want to stick to it so you can get the best nights rest as possible. What if my baby won’t eat for the dreamfeed? Keep trying! You already know the benefit of the dreamfeed. However, after you have put forth a good effort for it, if baby won’t eat, put it aside for a period of time. Kaitlyn would not eat for the dreamfeed, so I didn’t bother. I fed her at 8:30 and then went to bed. Over time, however, her days lengthened out and her 8:30 feeding moved to 10:00. She then had a dreamfeed. McKenna also didn’t eat well for the dreamfeed at first. I worked harder to establish it, though, so we could go down to fewer night feedings sooner. The work paid off. Note that Tracy Hogg, the Baby Whisperer, says that if you are trying to get a dreamfeed and cluster feeding in, the dreamfeed is the more important of the two. If cluster feeding intereferes with the dreamfeed, shoot for the dreamfeed instead. Should I un-swaddle my baby for the dreamfeed? Possibly yes, possibly no. When McKenna was a young newborn, I unswaddled her so I could wake her up. I still unswaddle her, but it isn’t to wake her up. It is because I start the night with her in a lighter swaddle blanket and move to a warmer one after the dreamfeed. You can definitely leave your baby swaddled if she will still eat well. Should I change my baby’s diaper at the dreamfeed? 8 hours at night, I move to a bigger diaper for night if necessary and don’t change the diaper at the dreamfeed. So, again, change if you find it necessary. If not, put some diaper ointment on the bottom and leave it for the night. Should I burp my baby at the dreamfeed? ed. With an older baby (say around 4 months or older), you might not need to burp the baby. Some babies burp on their own by this point, so you don’t necessarily need to work on burping. My thought is this. Would you rather take a few minutes and try to burp baby, or risk having baby wake up in the night due to gas pains? I think trying to burp is well worth it. You might not get anything out, but it is worth a shot. Should I wake my baby up for the dreamfeed? This is again dependent on the baby. Some find baby sleeps better at night if she wakes during the dreamfeed. Others find baby sleeps better if she doesn’t wake for the dreamfeed. Keep notes and see what works best for your baby. You want to work to get a full feeding in, but weather she truely wakes up or not is completely up to her reaction to it. When do I drop the dreamfeed? Most Babywise babies will drop the dreamfeed somewhere from 3-7 months old. I think most will be ready around 4ish months. You can start to consider it once baby has slept from the dreamfeed until your morning wake up time consistently for two weeks. See Poll Results: What Age (Approximate) Did You Drop the Dreamfeed? Hogg says to keep the dreamfeed until baby is about 8 months old. You can choose to do that, but I doubt it is necessary for most babies. The dreamfeed can really start to interfere with night sleep as baby gets older (see Note below). How do I drop the dreamfeed? NOTE: some babies don’t do well with a dreamfeed. This will be true if it is disrupting baby’s natural sleep patterns. This is more likely to be possible if baby is 4 months or older. If you think the dreamfeed is disrupting sleep but baby still needs the food, try having the dreamfeed at a different time. Otherwise, try dropping it and see if that fixes things. The dreamfeed is very much worth doing if you can make it work. Read the post The Benefits and Drawbacks of Doing a Dreamfeed for more. Poll Results: What Age (Approximate) Did You Drop the Dreamfeed? I was hoping you'd do a post on this. My baby is 10 weeks and I stopped her dreamfeed a while back because she ate so much at 7pm that even if I gave her dreamfeed she woke up at the same time anyway. Should I start it again? I'm wondering because you say to drop it between 4-8 months and that's still a long time away. She currently sleeps from about 9pm to 5pm give or take but has been doing a solid 8 hours for about 2 weeks now. Do you think she will be able to extend it to 9-10 hours if she doesn't have a dreamfeed? I dropped my older son's dreamfeed at about six months or so. I started to do it at one point, a little earlier, but had to postpone it b/c he started teething horribly and I didn't want to make things worse, seeing as his appetite was already low.With my younger son, it was a litle closer to seven months b/c he had open-heart surgery at five-and-a-half months and I wanted to be sure he had recovered fully.With each boy, I just moved the time back fifteen minutes for three or four days at a time. So 10:15, 10:15, 10:15, 10:00, 10:00, 10:00, 9:45, 9:45, 9:45, etc., until I reached 8:45 or 9:00. (Their last feeding was between 7:00 and 7:30 if I rememember correctly.) Then I just stopped. Neither one of them ever woke up any earlier than usual because I dropped it.I must say that I love dropping the dreamfeed so that I am freed up from doing it (so I can go to bed for uninterrupted sleep or go out to a late movie, etc) BUT my milk has started to dry up and I've had to wean just a few months afterwards b/c I guess only nursing four times a day (which is what is left after the dreamfeed at the point where my boys were) just wasn't enough to keep my supply up. My daughter will be 5 months this Sunday. I tried to do babywise from birth, but haven't done it perfectly. In any case, she nurses still 6 times in 24 hours. She eats at 7:15 or 7:30 and goes to bed about 8:15. I get her up at 10 for a dreamfeed. This has worked really well until the past couple of days…instead of sleeping through it, she has been wide awake and cried when I put her back in bed. She has been sleeping pretty consistently after the dreamfeed until 7 am (in the last 2 weeks, I think she has woken up 3 times, two of which have been the last 2 nights). Do you think I should try to drop the dreamfeed altogether or adjust the time first? My daughter is 7 weeks old and our life has gotten so much easier since I found your blog and we started doing BW!! Our last feeding is at 7:00-7:15 and Morgan is in bed by 8:00. We do a dreamfeed at 10:30 and another one between 2:30 and 3:00. My question is should we be getting her out of bed for a dreamfeed in the middle of the night or just let her wake up. When she wakes up she tends to be up and has trouble going back to sleep. Will the middle of the night dreamfeed eventually cause her to expect this feeding and make it hard to drop later on? Thanks again for all your advice!! My son is 15 weeks old and I have to say, the dreamfeed doesn't work well for us. Maybe he is one of the babies you reference at the end of your post. He eats his last feed of the day around 7-7:15 and is in bed by 7:45pm. He usually sleeps 7-8 hours, so wakes up around 2:30-4am for his next feed, then usually sleeps till his waketime of 7am. My husband has to leave for work around 6am and I like to get up and eat breakfast with him (I know I'm crazy!!) so we are in bed at 9pm. I've tried to wake up at 11 to dreamfeed, but Jack STILL wakes up in the middle of the night to eat. I've just decided that I'd rather wake up once in the wee hours than twice. Lately, I've changed his diaper first, re-swaddled him, and put him down after eating on one side only. I have a lot of milk so it seems to work well for us. Hopefully we'll see this night feed go longer and longer to morning. If you think about it, will you do a poll on the effects of reflux on babies' ability to sleep longer stretches at night? My son has reflux and when he spits up a large volume of milk, it affects his ability to sleep longer stretches at night. I'd love to know when other moms of reflux babies (and I mean clinically diagnosed with it- not just ones that spit up b/c all do!) see their babies sleep 9-10 hours at night. BW states that most babies with medical conditions will start sleeping thru the night at 13-16 weeks, which is longer than normal. Just a thought! My son is almost 6 weeks old, and I've been nursing him 7 times a day. His last daytime feeding is at 7pm, and then I wake him at 10pm to eat. He has been waking up when I feed him (between feeding and diaper change), and then has a hard time going back to sleep. 1 – how do you keep your baby asleep to do a true dreamfeed? The same is true for his middle of the night feeding (anywhere between 1-3am, whenever he wakes up) – he wakes up during it, and then I have to try and get him to go back to sleep. He also only has that one middle of the night feeding, but has been waking up between 4:30am-5:30am, and our day isn't supposed to start until 7pm. 2-how do I get him to stay asleep from his middle of the night feeding until our day begins? My son is 3 (almost 4) months old. He was having a terrible time falling and staying asleep during daytime naps, but he would sleep all night or only get up once. Now, he is falling asleep by himself during the day and sleeping 1 hour for three naps while one nap is usually 2-2 1/2 hours (yay!) but he has reverted to getting up twice at night! His last feeding is 7pm, then he goes to bed right after. I dreamfeed around 10. He used to get up around 4 or 5am, now he gets up around 1, then 3 or 4, and has trouble staying asleep until 7am (our normal wake up time). I have tried dreamfeeding earlier or not at all, but he still wakes up between 1 and 3 no matter what. Should I stop the dreamfeed altogether? Or keep it and when he wakes the 1st time just let him CIO or give a binky? Oh-Typically I only feed him that first waketime and my husband and I just try to get him back to sleep the other times that he wakes up. We stopped doing the dream feed when my son was about 3 months old because he still was not sleeping through to the morning despite the dream feed and I finally decided that I'd rather go to bed when he does and get as much sleep as I can before his early morning feeding, instead of setting an alarm or staying up till 10 or 11. As soon as we stopped doing the dream feed, he started sleeping through till morning. cbhoff, yes, she will be able to extend without a dreamfeed. It just might take you longer to get to her sleeping until your morning waketime. Personally, I wouldn't worry about getting it back in there unless you feel later on it would help. Angela, how scary to have surgery that young! There are moms that need at least 5 feedings a day. In the future, I would suggest you pump before you go to bed to ensure milk supply (that is assuming you have another child). Mo's Mom,You typically wake her up for the dreamfeed at 10ish. But for the other feeding, you want her to wake on her own. I am glad the blog has helped! lwicks,1-I don't ever try to keep baby asleep during DF. I would just leave the swaddled if you wanted them to stay asleep.2-He might be waking at 4:30 due to hunger. He is (was) at the age where they should still be taking at least 8 feedings a day, so he might just need more feedings in the day. See Early Morning Feedings Before Waketime for more on this early morning feeding. cbella2272, He might need to drop a day time nap. Most babies go to three naps around 4 months.I would stick with the DF for a while and see if it works out. If not, you can try dropping it and see what happens. thesprain, that is not all that uncommon. It isn't in the majority, but a significant number find this to be true. I am tempted to try it with McKenna 🙂 But I want to drop the swaddle first. Hi! As a first-time mom and a believer in BW, I'm so happy to have found your blog. Finally, a recipe for "how"…not just "why"! My 6-week old had been on a 3-hour day and 4-hour night schedule from week one. Her last evening feed is 7pm, and then I would dreamfeed her four hours later, at 11pm. She would always wake around 3 or 4am, and then again at 7am. I experimented last week by eliminating her 11pm, and lo and behold, she went all the way from an 8:30pm bedtime to 4am or 5am wake to feed. But then I'm left with the problem of feeding her so close to her 7am morning feeding. I'm wondering: should reinstitute the dreamfeed, but do it earlier, say 9:30pm or 10pm. Would she then go until 6 or 7am? Trish, the only way to know is to try it 🙂 Give it a try and see what happens. Good luck! Hi–I was so excited to find your blog! I am expecting my first baby any day now, but had already read Babywise and Baby Whisperer due to the recommendation of friends. A question I've about the dream feed…What if you go to bed at 9pm instead of 10 or 11? My husband gets up early, so we go to bed at 9pm. How would the dream feed work for us? i started using baby wise this past week and my son is almost 4 months! I hope i am not to late trying this. he is falling into the day time routine greatly but the night time still is not budging. He will sleep about 2-4 hours still. How long does it usually take for the dreamfeed and all to start working? im spoiled my first boy who is 3 now sleeps 11-13 hours at night, so this is new for me! Any advise is welcomed!!! D&H,I often go to bed early when my babies are little just because I am so tired! What I would do is just set an alarm for the dreamfeed. So I went to bed at 9, set an alarm for 10:30 or so, fed baby, then went back to bed. What a great website – it has been so helpful for me! I am slightly confused about waking vs not waking a baby for the dream feed. Doesn't the baby need to be awake in order to eat? I have a hard time waking my 10-wk son to do the DF (I'm BFing) – it takes about 15 minutes to wake him up! So, I can't even imagine getting him to eat if he's not awake. Am I missing something? I do the DF at 10:30 and his previous feeding was 7:30pm (some are full feedings, some aren't). My ped suggested that I put him down after the 7:30pm feeding and see what happens, since it's so hard to wake him up. What do you think? Hi Natalie,Thank you so much for this wonderful blog, I so appreciate it and find it so useful!My daughter is 11 weeks old and she started sleeping through the night at 8 weeks. She is formula fed due to absolutly NO milk supply for me. I am wondering if babies on formula doing BW might be a little different? Not sure.My husband and I made the mistake of DF her at 11:30p for every DF, not even knowing that was considered a middle of the night feeding. We are going to try tomorrow moving it up to 10:30p. Right now she is on a 3-3.5 hour combo (waketime is 7a) and I am finding that she just isn't that hungry after 3 hours, sometimes even 3.5 hours, but I know she is too little to be going to a 4 hour schedule. Even though she is sleeping through the night, this week, she started waking up at 3:30a and will not go back down. Last night she cried off and on from 3:30-4:30a and put herself back down, and then she woke back up at 5:15a. At this point, I thought she was hungry, and fed her. She was very hungry and ate the whole 4oz bottle. Could this be a growth spurt? I'm just wondering why she has started waking up again? I'm almost wondering if she doesn't need her DF since she is formula fed and might be a little dependent on just feeding even when she isn't that hungry, I'm also wondering if I drop the DF and go to a 3.5-4 hour schedule, which means I would need to drop the DF. I hope this isn't too confusing. I'm just trying to figure out what she has been waking up when she was doing fabulous for 2-3 weeks straight. Any advice would be so helpful.Thanks sooo much! Carolyn,My kids didn't wake up for the dreamfeed to full alertness. They just nursed and went back in bed. So they aren't fully asleep, but not fully awake.You can definitely try not doing the DF and see what happens. He might do great! If it doesn't work out, you can go back to the DF. I had a question about dreamfeeding and how long to try it before seeing results. My 4 month old does great going down for her naps but is still only sleeping 5-6 hours at night (she goes down at 7pm)and then wakes to eat every 2-3 hours after that. I tried the dream feed 2 nights in a row but it didn't change anything. Do you typically have to try it for a while for them to adjust or should it just work right away? Thanks! Jether, I don't have experience in starting it that late, so I am unsure. I would say that you would need to try it for at least a week before deciding if it will be helpful or not. If you like, I can post your question as a "help a reader out" post and we can see if there are readers with experience in starting late. Let me know if you want me to do that. AnneMarie,You need to figure out what has changed. Analyze her environmental factors to be sure that hasn't changed at all because that might be your answer.It could be a growth spurt. It could be that the dreamfeed is now just too late for her and is disrupting her sleep. I wouldn't drop the dreamfeed and go to 4 feedings a day at the same time at that age.This is what I would do:1-analyze environmental factors2-move dreamfeed to anywhere from 10-11 PM3-be sure it isn't a growth spurtThen wait a week or so after making changes. If nothing helps, 4-try dropping dreamfeedI would be 100% sure it isn't a growth spurt before dropping the dreamfeed. hello all…. Great site I have lurked on since the birth of my now 2 year old son. I believe I posted about separation anxiety at bedtime… which lasted roughly 3 days and vanished with no intervention from us. Kendall (1st born) fell right into the BW schedule and gave up the overnight feed at exactly 12 weeks. We think it took that long because of his parents being to conservative and weary of very early morning (5am ish) feeds so we held onto the 3:00am feed longer than we should have. Realistically, I think he could have given it up at 8-9 weeks. New query: My new son, almost six weeks old, has fallen into a rather good routine… in terms of the daytime. He eats 5oz. at the following times: 6:30ish am, 10, 1, 4, 6:30, and a dreamfeed between 10-11pm. His waketime is roughly an hour…give or take five minutes… and so far (fingers crossed) his naps have been uninterrupted and a consistent 2 hours. Our issue is… he simply cannot go longer than 3.5 hours overnight without waking and demanding to be fed (formula) and subsequently his morning waketime is a less than desirable 6-6:30am instead of our preferred 7am.What's weird is… if I feed him at 7pm and put him down @ 8pm… I think there are times he could sleep until nearly midnight… almost five hours from his previous feed. Just tonight I fed him at 6:40 and put him down at 8:00… and as a test decided not to facilitate the dream feed at the usual 10/11pm and surprisingly he slept till 12:15am. He can't go more than 3.5 from the dreamfeed through the overnight hours? How on earth can he go almost five hours earlier in the night… but only 3.5 overnight?Any thoughts… suggestions…trances you can send our way?ChristopherMidlothian VA.
Stephanie, you could try dropping it and see what happens.You could also try moving it to a different time.At his age, chances are good that he can go from last meal until morning. But you might need to pump, at least for a while. Christopher,It could be that he is being disrupted by the dreamfeed. If that is the case, you can either stop doing the dreamfeed or try it at different times. My third child slept much better if it was at a certain time than others. I can't remember it all right now, but it seems the times were about 20 minutes or so different (it is all documented in my newborn summary posts). When I fed her at the earlier time, she slept better.You could also try cluster feeding (see blog label "cluster feeding") to see if that helps. My daughter is 16 weeks old and I have never done a dream feed. However, right now she wakes up between 3 and 5 am. Should I try to do one or is it too late? Her last feeding of the day is usually around 8:30 or 9. Thanks! You can always try it and see what happens. But you might also want to just wait for her to start sleeping longer without it. She is almost the age when you would drop it. If it were me, I would probably just wait it out….though it might be worth a shot to get you more normal sleeping hours in. My son is 11 weeks old and he is doing a great job sleeping through the night. I feed him at about 10pm each night and he sleeps until 7am. My problem is with his evening sleep, or lack thereof. We are on a three hour feeding schedule, so I feed him at 7pm, but he won't go to sleep after. I've tried putting him down right after I feed him, or keeping him up for various lengths of time, but he just won't sleep between the hours of 7 and 10 pm. Sometimes he'll sleep for five or ten minutes in the swing, but if I put him in bed he will most often cry for hours. He doesn't cry like that for his naps during the day. I'm just not sure what to do. The 10pm feeding is supposed to be a dream feed, but my son is never asleep before that feeding. Do I need to try to keep him up longer during the day? (He is usually awake for about 60-90 minutes, depending on the time of day) I'd appreciate any advice you have. Thanks! Kerri, it sounds like witching hour–see posts on that for more. First, Val, thank you for this blog. there have been so many helpful tips. Second, Mamaof1, i'm exactly where you are. my DS is 9.5 wks old and is on a 3 hour schedule. i have been doing the DF for the past 3 days however he still awakens at 2am and 4:30-5am at which time he will usually take one breast more often thatn both. after the 2nd MOTN feeding, he also is restless until 7am, sometimes wide awake and sometimes fussy. i'm wondering if i should drop the DF as well. i'm curious to see what you think. thanks so much in advance! oh i should also say that DS weighs about 11 lb 5 oz and has never slept longer than 3.5 hours during the day or night… and i can't figure out why! maybe he just needs to wake up and eat since he's so small? Mamaof1,You will have to decide what you think on the dreamfeed, though if it isn't helping, I wouldn't bother with it.Anytime between now and 12 weeks, he can go 7-8 hours between feeds (can, doesn't mean he definitely will). So if he eats at 7 PM, That puts him at 2-3 AM, which he is almost doing right now. See the "babywise milestones" post for ages on when feedings extend beyond that. Good luck! hunniebee530,Many say a baby can't go 7-8 hours at night until the baby reaches 12 pounds, so that can be a factor. Second, make sure day naps aren't too long. You said he hasn't slept more than 3.5 hours day or night, and if you are letting him sleep that long in the day for a nap, that could be why he is restless at night.Also, for both you and MAMAof1, be sure baby is warm enough or cool enough. And consider gas pain. Brydson's, the 9 PM feed would be your dreamfeed. Since you feed at 9, I wouldn't recommend doing one after that other than when baby wakes on his own. Thanks plowmanators…no his day naps are usually no more than two hours and half his naps are 45min due to the 45min sleep cycle/intruder. Interestingly enough my husband did the dream feed at midnight this past saturday(baby was last fed around 7p) and baby slept from midnight to 630am..i reweighed him and he is a few oz shy of 12lbs now. Yesterday night however with a dream feed at 1100, he was back to waking up at 2 & 5am to eat. Was saturday a fluke? also interestingly enough, last nite when he woke up at 2 & 5am, he was whimpering/crying and intermittently sucking his fingers on a hand that had gotten free out of his swaddle..do you think that is just because he is hungry or trying to self soothe to sleep? I nursed him both times and he ate for about ten to 15min each time. I think he is an efficient eater though im not sure if he is taking a full feed. Thanks in advance! Your blog has been amazing to follow and encourages me! So today he cried out @2am, his usual time, despite a dream feed at 1120p (i know, its technically not a DF because its after 11- does that make a big difference?) and I tried something different. I wanted to see if he is in fact hungry. I put the paci back in his mouth and he whimpered and fussed for two min and then I heard him pass some gas. Do you think perhaps its gas pain? But every day at 2am? That seems odd. In any case after a few min, he fell back asleep quietly sucking in his paci. Do u think it was okay that I didnt pick him up and feed him like I normally would have? And if he isnt hungry, then at 2am, should I let him CIO instead of going in and replacing his paci? Thanks so much in advance! Hunniebee, if he sleeps well after going to sleep without eating, then you know he wasn't waking for food. If he woke an hour later, then I would say he wanted food. If not, then I would say he was waking for another reason. If he is not hungry, I would do like you did and try to get him to go to sleep by some means like the pacifier. I think CIO at night is hard to manage correctly for most people. My kids all slept through the night where they would sleep through some nights, not others, sleep through some, not others. They didn't just start sleeping one night and stay that way. thanks so much for your input. it's so hard to figure these things out and just when you do, things change =) it seemed like he was stretching out his feeds better the past week – DF at 10:30/11 and then waking at 3:30/3:45 to eat and then waking at 7a close to the desired waketime of 7:30. however this week i've been trying to make changes because of the time change coming up. i know consistency is key but it's been tough to be consistent. i feel so unsure. i feel like his nighttime sleep was getting better and now this week it has been tough again because he's on a 3 hr schedule approx 7/10/1/4/6/8/11(DF) and his 3rd nap has not been going well. he wakes up 30min (2:30) into it crying and after going into the swing doesn't fall asleep but stays awake and wants to play. then for the 4th nap he'll again wake up 30 min into it but because he's so tired when he's put in the swing, he sleeps 2hours (6-8p) and would probably keep on sleeping if i didn't wake him up. should i just be putting him to bed earlier? so then i nurse him at 8p like a DF but he wakes up and wants to play so we do our bedtime routine/bathe and put him down at 9p but he again sleeps 30min and then wakes up screaming for 30min. i just am so unsure what's going on. i gave him the paci but really don't want it to be a prop. do you think he's hungry? we deal with the 45 min intruder at least 1 nap a day but now its more like the 30 min intruder? i'm sorry, i'm so tired and i've been back at work as a physician (12th straight day in a row at work tomorrow) and i'm just unsure how to proceed. Thanks for the fabulous blog! My daughter is 17 weeks and we started BW at approximately 10 days. She fell into a 3 to 3.5 hour schedule naturally, even sleeping 4 to 5 hours in the night early on. At 12 weeks, she started sleeping from her dream feed until early morning feeding (10 pm to 6am) for two weeks, then she started waking up at 3am consistently. We were uncomfortable letting her CIO at that age, partially because our schedule doesn’t allow for a weekend where we can get some extra sleep as suggested in BW. So we tried putting her down at 8pm, her normal bedtime, to see how long she slept. Now it seems, she has eliminated her dream feed on her own and is sleeping from 8pm to 3am, then waking up at 6 (our early morning feeding) and going directly back to sleep for an hour before we leave for daycare. Her current schedule is feedings at 6am, 9:30, 1:00, 4:30, and 7pm and she sleeps/naps from 6 to 7am, 10:30 to 12:30, 3:00 to 4:00, and 5:00 to 5:30 when I pick her up from daycare, then bedtime is 8pm. I would rather give her a DF, but she was still waking up at 3 am. Letting her sleep the way she is right now, at least she gets 7 hours of straight sleep. How can I help her eliminate the 3 am feeding, should we reinitiate the dream feed and hope that she sleeps from 10pm to 6am? Let her CIO at 3 am? Wait it out and see if she starts extending her night time sleep on her own? hunnibee, I would guess if he is waking around 2:30 and then not sleeping again until 6, he is quite tired. At that time, you might try getting him up for about 30 minutes, and then trying the swing or back to bed to see if he will go back to sleep. I had a friend who did that for a period and it seemed to work well. Kelsey,It could be the 19 week wonder week happening (see wonder weeks blog label for more on that). You could try the dreamfeed and see if that helps and if not just stop doing it. Good luck! I am a little confused about the dreamfeed. My son is 5 weeks old. We try to start his day at 7am. So starting at 7 his feedings would look something like this : 7am, 10am, 1pm, 4pm, 630pm, 830-9 pm (the witching hour issue causes him to feed more frequently). He will then wake up anywhere between 1230am and 2am then again around 5 am. Would you suggest still waking him up around 11pm for a DF? Christina, I would try a dreamfeed at 11 and see if that helps cut out a night feeding. Kat,There are a few common reasons for this at that age, and they all revolve around day/night confusion OR too much daytime sleep. I assume you wake her consistently in the day since you said she is eating every 2.5 hours. Make sure she is up for the right amount of time and work on having wake time after every feeding.Something else you can try is taking her out at noon every day for a minute or two. I have heard some people claim it helps set your circadian rhythm. Might be worth a shot if you can do it. Kristine,end of day might be "witching hour"–see the posts on that for help.The dreamfeed you can definitely try to implement. It is worth trying to see if it works. Great to hear! Thanks for the update! Ok so I have experimented with df… It seems if I do the df she makes it to 4 if not she makes it to 1. If I do it shouldn't she be going all the way to our desired wake time???? Not sure if I doing this right. Hi there… first of all thank you SO much for writing this blog. My question is that I just started having baby CIO three days ago. She is six months old and I had been nursing and rocking her to sleep until then (oops) but I was going crazy with her waking up for feedings at 1 am and 4 am so that is why we started letting her CIO and started the baby wise routine. The last two nights we woke her for a dream feed at between 10 pm and 11 pm. Tonight (before we were able to get to her while she was still sleeping) she woke up crying at 11 pm. I am assuming this is because she is now used to getting a bottle at this time. I wasn't sure if I was sending her mixed signals by going in and feeding her right when she started crying because as I mentioned we had been letting her CIO through the other times that she was accustomed to being fed. So I guess my question is do I let her CIO and then once she is asleep go in and do the DF or do I go ahead and feed her? I hope this all makes sense! Thank you for any help/advice! Toogoods,One thing to keep in mind is a reflux baby will take longer to reach milestones than a non-reflux baby. Since she is sleeping later with the dreamfeed, I would keep it. For daytime, you just need to put her in her bed at the start of the nap. With reflux, it is good to incline the matress (see reflux posts for more). If she wakes mid-nap, I would move her to a prop at this age, but I would at least start naps in the crib/whatever. Ashley,I would feed her at dreamfeed time even if she started crying first. Good luck! First I want to say that I have found your blog to be really helpful, I'm a first time mom and trying to establish a baby wise household. My baby is 2 months old and starting to sleep 7-8 hours at night. We are not consistently doing a dream feed at night. I was just working off of my sons cue. If he wakes around that time, I feed him. If he doesn't then I was letting him sleep until he naturally wakes up. Doing this means that I am doing an early morning feeding (5:30) instead of a dream feed. I was just figuring that we would drop the 5:30 feeding when he was ready. After reading your blog and comments, I'm afraid that I have done this backwards. Should I try to correct this now or just continue to do what we are doing, knowing that we will eventually drop the 5:30am feeding? Thanks again for all of your posts….so helpful! My daughter is 8 weeks old. She feeds as follows:6a8:30a11a2p5p8p10pShe sleeps till at least 5 every night. If she wakes at 5, I can usually give her her paci and she sleeps till her first feeding. After her 8p feeding she is starting to not fall asleep till 9:30, so she sleeps 30 minutes then it is time for her df. Should I think about dropping the df in the next couple of weeks? I also have to wake her for every feeding during the day. I have read in BW and in your blog that I should not spread out her feelings until the DF has been dropped. Is it normal that she needs to be woken for each feeding?Thanks so much for your blog! It has really helped this first time mom navigate the BW method! Montgomery Clan, Hard to say. I think I would be inclined to leave things as they are. Some babies drop the dreamfeed relatively close to his age, so you could be close enough it isn't worth the hassle. However, my girls dropped it at 6 months and 7 months, so if he is like they were, it could be several months. I do think he is old enough it could be a challenge to change it up at this point. Amber, her having to be woken is best case and what people strive for–so it is good 🙂 I think dropping the dreamfeed sounds like it might be your next step. Good luck! My son is 6 wks old. His daytime feedings were every 3 hrs starting at 7am but have stretched out to 3.5 or even 4 hrs. Now he'll feed at 7:30a, 11a, 3p, 7p and sleep soundly until 2:30a, feed again, then right back to sleep until 7a. This is only 5 feedings total. I'm a little concerned he's not feeding enough but he's gaining weight and seems content. I hesitate to introduce a DF as I'm usually in bed by 9 and don't want to get up twice or throw off the rest of the schedule.If I DF at 10, and he sleeps the same length, seems that would put him awake to feed again at 5:30a, which is still a night feeding and then really close to the usual 7a feeding. But I also wonder if I never do a DF will I be up btwn 2-3am for a long time to come as well.If it ain't broke right now, should I try to fix it for the future of hoping to sleep btwn 10-7?Thanks! My daughter is 5 weeks old as of Saturday, so we're starting our 6th week as of yesterday. My pediatrician who is a Babywise advocate gave me a new feeding schedule of 7 am, 10 am, 1pm, 4pm, 7pm and then a 10pm dreamfeed. He explained that the 10pm dreamfeed is supposed to carry her through the night to 7am. Well, I've been doing it for a week since last Monday when we had our appointment, and no such luck yet! She's still waking up at like 1:30 am to eat, which puts her at only 3 hours from the 10 pm feeding. Then she's been waking up at 5:45, and 6 – not 7 am – , but that at least seems to be stretching out a bit now – the last 3 days she's woken up at 6:15 and 6:30 instead, so we're getting closer to that 7am time. So that means she's going much longer between that 1:30 am feed and the first "morning" feeding. He told me it might not be until 8 weeks that she drops this middle-of-the night feed, but I'm just curious if you have any tricks to make it happen faster. Or am I crazy? Is she actually doing well to have that one feeding in the middle of the night and that's it? Lastly – I am confused because in Babywise it says to do 7 feedings a day but it's also saying to do the dreamfeed to get them to sleep through the night. With my pediatrician's schedule that's 6 feedings in the daytime, and if she wakes up at 1:30 am, a 7th feeding. But what is the point of the dreamfeed if they are supposed to get 7 feedings, and one happens in the middle of the night? The whole point of the dreamfeed is to sleep through the night!? 🙂 So when the heck do you do the 7th feeding if they are on that 3 hour schedule during the daytime? Do you have to fit it in somewhere between the 5 feedings that take place between 7 am and 7pm? lewdal, I would be careful to watch the diapers and growth and add feedings if needed.I think there is a high chance you will be doing a night feeding for quite a while without a dreamfeed. There is a smaller chance you won't.I think it is just up to you what you want to do. You can be happy with how things are or you can see if you can get longer stretches yourself at night. I don't think there is one right move in your situation. L,See my post called "Babywise milestones" for guidance on what ages to do what.You can cluster feed to get an extra feeding in. You can also do a combo 2.5-3 hour schedule. I think your baby is young to be expecting STTN. BW says about 8 weeks old, so expecting it at 5 weeks is highly unlikely. Val, sorry I forgot to mention that they are great nappers: 1 nap morning at 9.30 for 2 hours sometimes even until noon, 1 nap early afternoon 1.30pm for one or two hours, 1 shorter nap end of afternoon starting between 4 and 5pm, for an hour max.They initially did 2 naps only but were very hyper and are in a better mood with the 3rd nap. I guess they behave more like 4 months olds than 6 months'. I try to keep them in synch for eating and sleeping times so I do wake them up when I have to. Q1. How important is the late night feeding, and what importance does it play in nighttime and daytime routines/patterns? My 5-week old son is on a daytime feeding routine of 6, 9, 12, 3, 6. (I’m questioning pushing his early morning wake time to 6:30.) We put him to bed btw 7 and 7:30pm and ever since birth he’s slept sound until 11:30pm/12. He eats good and then sleeps again until 4:15am. At 4:15 he eats some but not as much as the midnight feeding. I’ll feed him again and then wake him for his 6am feeding. Q2. Should I feed him at 8:30/9pm? And would that possibly prevent his 4am waking? Or should I let him sleep from 7-12 and let him CIO or decreasing the amount he gets at 4am? Thanks for your help! lilWill,The late night feeding helps baby sleep through your night of sleep. I would possibly do a 9 PM feeding, but I would likely do a 10 PM feeding instead. Remember that he is 5 (now 7) weeks old. 8 weeks is when you can expect to possibly have a 7-8 hour stretch without eating. So feeding at 10 PM could possibly take you to 6 AM. My 10 week old has followed BW since she was 2 weeks old and has done really well. She feeds at 7,10,1,4,6:30 (bath and bed for the night) and I have just started tring a dreamfeed at 10(also tried at 9, 9:30 and 10:30) and it does not make her sleep londer in fact she is waking up more frequently. Up until last week I was waking her up at 9:30/ 10 and giving her a bath and feed due to her wind prolems and she would sleep till 4:30ish sometimes longer. I stopped doing that because she no longer has that problem but now she is mot sleeping as long during the night. My question is should I go back to waking her up and bathing her at 9:30ish or should I put her to bed at 7:30 and let her wake when she is hungry? Is it less desirable to have a bedtime that is so late? Oh wow.This has just been my son's natural eating pattern. Hi, my bb is 5mo and we tried to df her few wks ago for 5 days but had been getting mixed results, sometimes still wake at 2am and 5am, sometimes 3am. She has nvr been a great sleeper. But until she fell sick last week, it was a nightmare at night. She woke every 1-2hrly in the night!! And has been like that for 4days already. I follow the 4hr easy routine and try to feed her at 7am, 11am, 3pm, 7pm. Bath at 8pm, nurse her to sleep btw 830-9pm. She used to wake ard 2am and 5am, but lately after I tried df-ing, and after she fell sick (she has recovered since), she's waking At 10plus or 11plus, and every 2hrly after that. My question is, do I continue to try df at 11pm? I'm concerned becox I nurse her at 9pm, to df at 11pm seems too soon? She's hardly hungry by then n I'm afraid I'm encouraging night snacking instead of prolonging her nighttime sleep. Pls help! Thanks! Thank you so much for helping us out with our baby sleep issues! I've done a loose version of Babywise with my babies, and I think it's been helpful, but I've never done the dreamfeed. My youngest son is 6 weeks old, and he has started to wake only once in the night–around 2am, after his last feeding of 7 or 8pm. Then he wakes up at 7am or 8am (depending on when his last feeding of the day was the night before). I'm afraid that if I wake him up for a 10pm feeding that he'll wake up at 5 or 6am and be awake for the day, which is worse, in my opinion, than waking once in the middle of the night. I'd rather have broken sleep and be able to sleep until 7am than to have to get up as early as 5 or 6am. Do you think that's likely to happen if I do the dreamfeed? Heather I know this is likely too late for you, but yes, I do think that is likely at that age. The baby would soon be sleeping in later though. For example, brinley was sleeping 9 hour stretches as early as 8 weeks old, so from a 10 pm dreamfeed, that put her up at 7. First off, I love your blog!!! I'm a 2nd time BW mom and it was so simple to put my son on a schedule. However, my newest little one is 10 weeks old and she has been so difficult. She is not a "by the book" baby. I give her the last feeding of the day at 7pm and then a dreamfeed at 10pm yet she will wake up 3 hours later no matter what. And she doesn't appear to necessarily be hungry but she's up (maybe by habit??). I end up just feeding her because I'm so tired and she won't just go back to sleep but then she won't get back up again until 7am. Any suggestions? I've thought about just letting her cry but then I'm afraid that she'll wake up earlier to eat! I don't know what to do! Try varying your dreamfeed time. That might help. You might also try cluster feedin to see I that helps her get further into the night. Help! I used BW with my son, who is now 21months… But, I now have a 7wk old, and he's been tricky, as he has GERD and has been much less happy than my first. He still sleeps well, last feeding at 7:30-8, with a dream feed at 10, he sleeps til 5:30-6. He eats 5oz of breastmilk mixed with 3tsp of rice cereal at 5:30, 8, 11, 2, 5, then bedtime, so I know he's getting enough calories during the day to drop the dream feed… I also have to wake him up for the dream feed, and he's been sleeping til 5:30-6 for at least 3 weeks….is it too soon to drop the dream feed, or could he really be ready? Hi Lorena, we are now in that boat (though your post was a year ago). We did Babywise with first son, but I can't remember how we made his secon merge. All I know is I desperately need it to happen. My 9 week old daughter has her bedtime feed at 8. Then we have let her go until… She wakes (usually 1) when I try to install a dreamfeed she wakes up more – like 2 and 5. So, should I keep w the dreamfeed or let her go from bedtime and hope she eventually moves that night waking back as she requires more deep sleep. BW says they just eventually sleep through the night, but did we wreck that by not having a dream feed to begin with? Hi! Was seeing if I can get your input on our situation. My son wil be 7 months old next week. We are still on the 3 hr schedule and dropped the dream feed a month ago. Well this week he has been waking 1-2 hrs early that 7a (our desired waketime). So I did a small dream feed (only 2 oz) last light and he slept through until 7am. My question is he is soooo ready for a 3.5-4 he feeding schedule due to his waketimes being almost 2 hrs long. But he doesn't eat as much solids that yet (just not interested really) and his bottle are only 6oz.. I've tried offering more oz per feed but he can only drink up to 6 due to his reflux. Is it ok to jump to a 3.5-4hr schedule and still have that 5th feed a dream feed? Yes it is definitely okay! Update: I am not dream feeding and he is waking up at 2:30 and then 6:30/7. I would prefer this over a dreamfeed bc I hate setting my alarm to get up. Will this make it hard to drop that night feeding and when can that be done? Thanks! Statistically he would drop the night feeding later than the average baby who is doing a dremfeed, but if it doesn't work for you, don't do it. My lo is 17 wks old. We've been doing BW since birth but she has only SSTN once recently. She was born 1 mo early has reflux (on meds) and gas. She appears to be in leap 4. Her typical schedule is: 7, 10, 1, 4, 7 (bath, bed around 745 or 8), 10DF, wakes at 3 am on own to eat. Was waking at 5am every a.m. stopped feeding her at 5am and decreased 5am waking by about 75%. Distracted for daytime feedings but still taking 4 – 5 oz at most feedings (strictly formula).Daytime naps: 2 have shortened to 45 min no matter what we try and 2 are typically 90 min. She seems tired after approx 80 min awake. Sometimes we keep her up 90 min+ and she naps better. 1) Should i drop a nap? If so what does that look like? Does she stay awake twice as long and feed twice on schedule in an awake interval? 2) could the swaddle be interfering with sleep? She gets so angry now and frequently gets out of even double swaddle with one being velcro. Still has some startle reflex but getting better, sometimes can nap with arms out sometimes not.3) recently has been too tired to eat at DF NO matter what we do. A few nts ago only took 2 oz then woke at 3 am and ate and 5am (no food) but angry and then back to bed with work. Two nts ago got so angry when DH tried to wake her for DF. Last night she would not eat too sleepy so dropped DF and she woke at 12 hungry (ate 4oz), 4 am hungry (ate 4 oz), 6 am arm out and pissed. Went back to sleep on mom til 7:15. 7:15 too distracted too eat. Thoughts???? Mom is exhausted. You are at the age to go to 3 naps. So after the 4 pm feed, do no nap and feed again at 7 and then go right to bed. I would get her ready for bed before feeding her at 7 because she will be tired. 2- yes the swaddle could interfere with sleep of she is ready to drop it. The best way to know is to try it and see what happens. I wouldn't do it for the first nap because of that nap goes wrong, the whole day will be off. Try it for the third. It also might just be the 19 week wonder week, so if she doesn't sleep well without the swaddle, go back to it and try later. 3- try a dreamfeed at a different time. Remember they naturally transition every 45 minutes, so if you can time it with a natural transition, she will be easier to wake. Thank you. So you are suggesting this: 7am nap, 10am nap, 1pm nap, 4pm no nap, 7pm feed straight to bed, DF (try a different time. So far 10pm and 11pm have not worked). Last night she took 2 oz only at 9pm DF and then woke at 12am. I gave her 2 more oz because she seemed hungry and she slept til 6am. This is the longest she's gone. She would not go back to sleep at 6am and was clearly hungry (normal DTW is 7am).There's a sample schedule in BW book that suggests: 630, 930, 1230, 330, 6, 830/9. I was wondering what the point/difference is?If I'm able to get her to eat at the DF and she still wakes at 3am (the time she's used to eating) should I not feed her? If she doesn't eat at the DF and wakes at 1, 2 or 3 should I feed her? I hesitated to wean a feeding bc she was under 6 lbs at birth but she's Almost 14lbs now and catching up. Supposedly because she was early she is before leap 4 but she has all the signs and is mastering those skills now.She is sleeping better in a sleep suit than the swaddle. The exact times you feed each day aren't necessarily important. You do want bed time to be in the 7 pm hour, though some do earlier because they need to get the baby up earlier and some do later so a spouse can see the baby each day. Whether you feed in the night after a dreamfeed depends on if the baby is hungry or not. If the baby is hungry, you always feed the baby. We dropped the DF because it wasn't working. Going to bed at 7 or 730 she wakes at 2 or 3am usually. I'd be surprised if she is hungry given she is eating 26-30 oz a day and just started rice cereal 2x a day (small amount) a week ago. I want her to keep 7am wake up time bc that works for us. I am considering moving back her bedtime to 8pm w last feeding right before bed in the hopes she can go longer without waking. We are down to 5 feeds during the day and maybe 3 oz in the MOTN. How do I know if she's ready to transition to the 3.5 hr schedule? She has been spitting up much more since she increased her intake over the past 2 wks. She has reflux and the pain is controlled with meds but seriously so much barf!We dropped to 3 naps a week ago too and we were trying to drop the early evening nap so she'd be more tired for bedtime but she typically takes her shortest nap in the morning. She has been getting fussy during that early evening time understandably she is tired.If I want the last feed to be around 7:45 pm, should I try to do the previous feed around 530 so she doesn't have to be awake as long? I am not sure if she'll be hungry at 7:45 them after a bottle and rice cereal at 530. Or should I keep that feed at 5pm and see if she can adjust to being awake longer during that time? One evening she took a 40 min catnap which is also fine.Or should I try dropping the morning nap since she usually only takes a 45 min one anyway?She's 19 weeks this Wed. She's in the 68% now for weight. I have an almost 8 week old baby who's schedule looks like this: 7am/10/1/4/6/8:30 with a dream feed at 10pm. His naps are normal throughout the day with napping for the last hour to hour and a half after each feeding. I always have to wake him for his next feeding though. He usually has one long wake time where he wants to stay awake from one feeding to the next. Usually this is from 4pm til 8:30pm. I cluster feed him at 6pm. He usually fall asleep for the night at 8:30pm or 9pm but takes a full feed for his dream feed at 10pm. He is sleeping until 5 or 5:30am, which I know is great for that age, but he is wide awake and ready to play after his 5am feeding, which means I'm not able to go back to sleep. He doesn't want to go back to sleep until he eats at 7am and then he crashes. Any ideas on how to get him to sleep after this 5am feeding? I should add that he is almost 12 pounds, doesn't really take a binky, is formula and breast fed, usually eats 5 oz at every feeding, and is really cute 🙂 thank you! That is tricky. If it were me, I would do some experimenting with the dreamfeed time. Try 10:30 and see if that changes when he wakes. Will he sleep in a swing? If so, I would probably put him in a swing after feeding at 5 until it is officially time to get up. Hi! What a helpful blog! I have a 9 week old son who is STILL demanding a 2 hour schedule! He is exclusively breast fed and weighs in at 13 pounds (born 6.12) so he is gaining rapidly! At 8 weeks he was stretching 3 hours and 4-5 at night! I was thrilled! This week thiugh, he is back to 2 hours and sometimes even 1.5 day and night! How can I get him to get on a 3 hour schedule? Is this a growth spurt? Is this normal? What's a good sample sleep- eat schedule for me to enforce on him at this age since there haven't been any regular patterns for me to follow with him unlinke my first son who was much more predictable? Please HELP!!!! He is definitely at a growth spurt age. Growth spurts are every 3-4 weeks. If that is the case, this is just a wait it out situation. Another possibility would be that he is not taking a full feed at each feeding. Is he falling asleep during eating? Are you breastfeeding? If so, do you feel empty when he is done? Hi Valerie,My son is currently 3 months old. We have him on a 3 hour schedule with 3 naps of 1.5 to 2 hours and 1 cat nap. He's been STTN with the dream feed for about 3 weeks. I would like to drop this feed, but I am worried about him not consuming enough calories. I tried feeding him more during the day, but he either won't take it and if he does, he wants to go longer between his next feed. Should I try to drop the dream feed first and then see if he will eat more or should I keep it this way until he can consume more during the day? should I try a 3 hour/3.5 hour combo schedule? He probably wouldn't take more until he needed to–so after the DF is dropped. You can always try dropping the dreamfeed and see what happens. You could add it back in if things didn't go well. I will say that sometimes when people try things out and they don't work, they are messed up for a while. Personally, I would wait until he has been sttn for 4 weeks before messing with it. But I am a cautious person–sometimes overly cautious. And a DF can start to disrupt sleep if your baby doesn't need it anymore. So if you feel like it is time, go for it! Hi Valerie,I am having an issue with DF that is not technically a DF. My daughter is currently 5 months old. I did not read Baby Wise until after she was about 8 weeks old and while we were already doing eat/play/sleep we weren't doing a DF. I tried implementing a DF when she was about 12 weeks old and it backfired on us big time. It disrupted her sleep for several weeks and still is. When she used to sleep from the time she went down until around 1 or 2, she now wakes up for a feeding on her own between 9 and 10 which is why I say it's not technically a DF. She is on a 3.5 to 4 hour combo schedule feeding around 7, 10:30,2:30,6:30,9:30 and then she still wakes up around 3. I am trying to wean her off the 3am feeding by slowly cutting down on the amount of time she BF. She goes to bed around 7 and wakes up around 7. I know we have done things out of order. She moved herself to a 3.5 to 4 hour schedule, as she would not take a feeding any sooner than that. I believe that eating at the 9:30 time is really starting to disrupt the rest of her night. Do you have any suggestions on how I can help her get better, undisturbed sleep? I will not be able to apply the suggested ways to drop the DF since she wakes up for it on her own. Your trick is figuring out why she is waking around 9 for a feeding. The 9 pm might not be what is causing poor sleep, but the poor sleep just an extension of why she is waking. If she is hungry at 9, there isn't a lot you can do to stop the waking other than feeding her more in the day. If she isn't hungry, you could try the wake to sleep solution from the baby whisperer. Hi Valerie,I dropped the dream feed last night since he was STTN for 4 weeks and I was able to get him to consume the amount of milk in 5 feedings vs 6 so I felt maybe this was the time. His last feeding was 630pm and he actually did well. He woke up at 6am instead of his normal time of 7am. I am not sure if he woke up because he was hungry or because he rolled over. He started to learn how to roll over recently and that's another item I am working on, weaning off him off the swaddle. He use to be good at self soothing himself back to sleep, but now he just rolls over. Any suggestions on what to do there? Should I feed him later at night, maybe at 730pm and see if he will wake up at 7am or should I keep the dream feed? It is a really hard call. It depends on why he woke early, and you are the best one to judge that. It is always tricky when there are multiple factors. I would trust your gut here and go with what you think. Hi Valerie,I waited a few days after the first night to stop the dream feed. The 2nd night I gave him the dream feed and he woke up again at 5am due to rolling over but instead of feeding him, I soothed him back to sleep. I figured out he was waking up due to rolling over so we bought a merlin sleep suit. It's much harder for him to roll over now. He hasn't rolled over at night. I decided to stop the dream feed last night since he was eating well during the day and he slept from 740pm to 715am 🙂 his last feeding was at 630pm. Wonderful! Thanks for the update! And I am glad the Merlin suit worked out–it is good to hear from people of they like it or not. Hello, this site is great. I hope it's not too late to ask a question! I was wondering if 5 months old is too late to start a dream feed. She sleeps from 8 until about 1;30-2:30 for a feeding but the other night she woke at night 9 and I gave her a feeding and she slept until 0630 ate again and didn't get up until 0930! I would love that but I am worried that with her on solids now is starting DF a bad habit to start and will it mess her with her sleep too much? She puts herself to sleep. There are times she wakes and I watch her look around for about 20 mins then goes back to sleep. But when she wakes crying I know it's actual hunger. Any advice would be awesome. My first did BW 4 hour schedule so easy and fast for some reason my second is cautioning on as quick, plus I noticed she cannot take as much for a feeding. Thank you so much. You can try it. On one hand, if she sleeps better, why not? On the other hand, she is about the age when you drop dreamfeeds. It is also an age that the dreamfeed can start to interfere with night sleep. But if she sleeps better 2-4 weeks earlier than she would otherwise, it is worth a try! My LO is 4weeks old. I tried 4 days to do the DF. No luck. She eats at 7pm then after her bath 8pm, she wants to eats some more. She is in bed by 815-830pm. She wakes up at 1230-1 and 330-4. Should I push for the DF? I forgot to add that she wakes up at 630-7am which is our start time. She gets anout 7 feedings during the day. Hi Valerie, we went through periods of doing the dreamfeed and not doing it. For the past few weeks /month my 21 week old has been waking on his own between 9 and 10 pm when his last feed was at 645/7pm. I and my husband have tried just going in and resettling him to try and push him longer. We have also tried little bits of CIO. However he is downright ANGRY because it's like he is famished when he often only ate 2 hours before. I've tried cluster feeding at night as well as spacing his schedule out more so he takes a full feed at 7 pm. Nothing has worked. Also, since he's been STTN, he's waking between 615-645 instead of wake time of 7am. Current schedule7-Feed9-1030 nap1030- feed1230-nap230/300-feed415/430 small fee done side-then nap for 30-45 mins645/7 feed then bedHe naps amazing during the day and seems to naturally slowly transitioning from 3.5-4 hr schedule.Thanks! I have a 5 week old. As much as I try to get him to bed after his 7:30/8pm feed he won't… He is fussy all the way to the dreamfeed time. Is that is a dream feed? I am trying to get him down so I can spend time with his sister. Is it better to leave him up like he wants? Need some advice…i have an almost 4 month old and he feeds at 6:30, 9:30, 12:30, 3:30, 6:30, bath then bed. Then I did a dream feed and he wakes during the night. Last night, I kept him up after his 6:30 feeding and fed him at 8:30000 and put him to bed and he didn't wake until 6:30…woohoo! However, he was exhausted from keeping him up and I want him to get used to an earlier bed time. Do I just fight his tiredness and keep him up till 8:30, or do I do a dream feed and let him cry it out a bit if he wakes? I know he can go 10 hours. Does the dream feed interrupt sleep? If I keep him up, will I be able to later get him to an earlier bed time? Hi, I'm not sure what to do and need some advise! This is my 3rd BW baby. My first two (girls) were textbook BW sleeping through the night by 6 & 7 weeks. My 3rd, a boy, is 12 weeks old today and still not STTN. Hos schedule is 730,1030,130,430,730. He wakes usually around 1 and 4/5ish and then hopefully makes it to 730. I did the DF for a while and it seemed like he woke more frequently in the night when I did it. I'm not sure if I should try it again? It seems like nothing is working. He pretty much is consistently up 2xs per night. He is a pretty big boy. Over 15lbs last time I checked at 10 weeks. Any suggestions? Should I try the DF again? Is it too late? Should I just ride it out? Hoping he will STTN soon? Thanks for any advise! Hi! My baby is now three months and three weeks. He is a pretty good sleeper. His last feed is usually between 6pm and 6:30pm and is in bed by 7:30pm. The bottle is the first part of his routine and he is fine without one at the end (it doesn't make him sleep any longer). Then he sleeps soundly for 8hrs when I need to feed him again (around 2am sometimes 3am). Then he would sleep until 6am. Not too bad. But I started just last night doing the dream feed at around 10/10:30pm to see if he drops the the 2am feed. Yikes no luck! He woke up at 1am (I refused to feed him). He kept soothing himself all night until 5am when he cried and then I fed him. From that point on he was cuing and ready for the day. �� Should I keep trying (and how long until it works?) or should I just go back to the pretty decent thing we had going on? Thank you!! Hi, My little one is 3 months, 1 week old (14 weeks). Being that I have her most days at work with me, I am ready for a regular schedule and would like to do BW. As I start to come up with my plan, I have a few questions/concerns:1. Being that she is my 2nd, she is in the car a lot and she tends to fall asleep in the car seat. Do I need to try to keep her up to meet the intended schedule? For example yesterday she napped from 10 to noon. Today she passed out in the car on the way to work around 8:30 and is still asleep. 2. So far her nap schedule is ALL over the place. Some days she naps so well and others she's awake ALL day. I have tried to see a pattern but there is NONE. Where do I even begin?3. Dreamfeed: is it too late to start this? Currently she does not go down for bed until 9:30/10/10:30 and then is up to nurse at 2/2:30 and then again at 6:30/7 which is a good "wake time" for our family. She is definitely tired around 7:30/8 pm but the commotion with our older child getting ready for bed makes it tough to get the baby to calm down so she typically powers through till we go to bed. I want to get them on the same schedule as soon as we can so baby's ideal bedtime would be 7:30/8. She is exclusively BF but I've been trying a (pumped BM) bottle at her 7:30/8 feed so she gets used to that in case hubby and I want to go out and to help with gas. I'd like to be in bed by 10 most nights but that seems too soon after her ideal bedtime feeding for a dreamfeed? I should mention I am not overly tired since it is really only one night feed but I'd love to get her to sleep through that 2:30 feeding.4. We have a very gassy baby and it seems to disrupt her sleep. I've tried everything and am concerned that a dreamfeed might cause a flareup of gas. We have had latch issues since birth and are not sure if they are ever going to be corrected but we think that is the source of her gas. She is happy for the most part and gaining weight so I have kind of just decided to stick it out. Bottle feeding seems to be good for her at night because we can control the flow and amount she gets. Maybe the bottle should be given as the dreamfeed and we should nurse at bedtime instead? Thank you for your time! Hi Val – thank you so much for your blog! I found it with my first, but my second is giving me a run for my money in the sleep department so I’ve really been using it this time! My daughter is 10.5 weeks. We’ve been doing BW since the beginning, but she has reflux, so the first 6-7 weeks were tough until we got her on medicine. Since then she’s been doing much better. We’ve had a consistent BW schedule from the start and lately we’ve even had improvement on the 45 min intruder for naps and she’s been taking nice long naps in her bassinet. But, she’s still not STTN. She’s done a few 5-6 hour stretches, but many nights is still eating every 3 hours, but not at the same time every night. Question on the dream feed: We can’t seem to get this down. She either has been totally awake from her last feed at 7, and the the 9:30/10 feed gets her to sleep. Or, she is so tired that I can’t wake her up for the dreamfeed/I feel like I just end up disrupting her sleep trying to wake her up enough just to latch. Occasionally it’s a normal dream feed. But I also can’t see any connection to when or how we do the dream feed and the nights she does longer stretches. Any advice? Or maybe the issue isn’t the dream feed at all? Thank you!!!! I would start taking detailed notes. I think you need to be able to look big picture to find a pattern here. I don’t know that this is a dreamfeed issue; at the very least, it is MORE than just a dreamfeed issue. Her sometimes being awake from bedtime until the dreamfeed is a whole other issue on its own. The big wrench in this is that it could be reflux that is the main factor. It could be nights she stays awake between bedtime and dreamfeed are nights her reflux is flaring and she is just uncomfortable and can’t sleep. Because of that, I would note when she is eating. If you are breatfeeding, take note of what you eat that might contribute to increased reflux. If you are bottlefeeding, take note of how much she eats. Reflux is hard. Reflux babies don’t sleep as well as early as they would without reflux. Reflux also adds in so many additional factors to consider. Good luck!